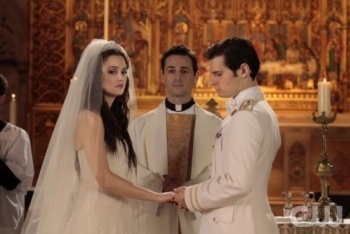 This week on Gossip Girl (Season 5, Episode 13), Blair’s wedding to Prince Louis nearly comes to a screeching halt. Read Kidzworld’s recap of “G.G.” which aired on January 30, 2012, to discover what you missed. Everyone knows that Blair shouldn’t marry Prince Louis because she’s still in love with Chuck. But Blair refuses to go back on her word to God, even if it means marrying a man she doesn’t love. On the day of her wedding, Blair’s mother makes one last attempt to save Blair from a loveless marriage. She summons Chuck to the chapel. Meanwhile, the priest of Monaco isn’t the only one trying to sabotage the wedding for personal gain. Georgina returns, hoping to destroy Blair’s wonderful day. She records Blair telling Chuck how much she loves him. Even though she denies it, the video is somehow leaked to Gossip Girl. Everyone sees it during the ceremony. Blair begs Louis to still marry her, promising that she loves him. To maintain his royal front, Prince Louis proceeds with the wedding. But during their first dance as husband and wife, Louis tells Blair that he will treat her like a stranger in their marriage. He tells her that Dan wrote his vows and that he does not love her. Panicked, Blair calls Dan to help her escape. During her royal sabotage, viewers finally learn that Georgina Sparks is the infamous face behind Gossip Girl. Maybe "G.G." doesn't stand for Gossip Girl after all! Party crasher Georgina Sparks looked dark and devious in her Burberry Gem Embellished Trench Coat, and Phillip Treacy Hat. Blair suffers a burden and looks beautiful doing it! She ties the knot in an elegant Vera Wang Spring 2011 Esther Dress. 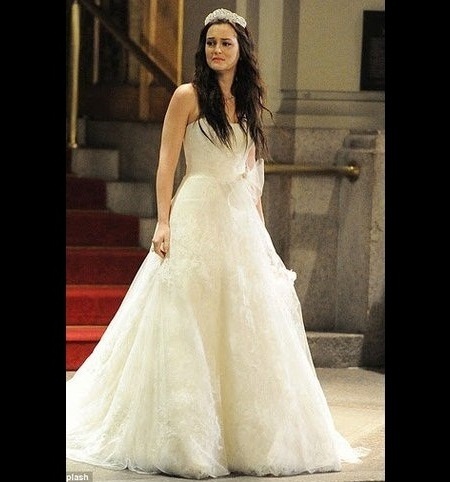 Do you think Blair should have called off the wedding for Chuck's sake? Tell us in our comment section below! Have You Been in a Wedding Party? Yeah, I've been a flower girl. I've been a ring bearer. Nope, but I've been to plenty of weddings. I've never even been to a wedding!